Colel Chabad of Rabbi Meir Baal Haness holds its 2018 International Awards Dinner. On Thursday evening, December 13, thousands of magnanimous supporters of Israel's oldest continuous tzedakah (charity) gathered at New York City's Hilton Hotel to express their appreciation to Colel Chabad of Rabbi Meir Baal Haness at the organization's 2018 International Awards Dinner. Going on its 231st year in fostering their mission of providing food, housing, clothing and social services to Israel's growing numbers of indigent residents, Colel Chabad takes pride in extending assistance to all those in need; irrespective of age, gender, background or religious affiliation. Established by the first Lubavitcher Rebbe and founder of the Chabad Lubavitch movement, Rabbi Schneur Zalman of Liadi, Colel Chabad has been overseen by each successive Lubavitcher Rebbe since. In our time, the seventh Rebbe, Rabbi Menachem M. Schneerson, considered Colel Chabad a personal and most cherished cause. Kevin Cummings, the Chairman and CEO of Investors Bank was Colel Chabad's esteemed guest of honor. Cummings has been the CEO of Investors Bancorp and Investors Bank since January of 2008. In addition to serving on the board of directors of Investors Bank and Investors Bancorp, he previously served as Executive Vice President and Chief Operating Officer of Investors Bank since July of 2003. Recipients of the auspicious "M'Dor L'Dor Continuing the Legacy Young Leadership Award" were David and Fortune Edelstein. David's grandparents, Michael and Florence Edelstein (Edel Family Management Corp.) had been honored 30 years ago for their tireless and dedicated work on behalf of helping Israel's poor through Colel Chabad's multifarious programs. 15 years after that, the same honor was bestowed on David's uncle, Ronald Edelstein of Ron Properties. The honor of assisting Colel Chabad has been time honored Edelstein tradition for decades and continues to be chief among the many charities that they support. Also being honored was Rabbi Yechiel Eckstein, the founder and president of the International Fellowship of Christians and Jews, which is headquartered in Chicago and Jerusalem. Rabbi Eckstein offered a personal perspective as he accepted the "Partnering with Colel Chabad to Make Miracles Happen" award. Rabbi Eckstein's exceptional generosity and largess is legendary. 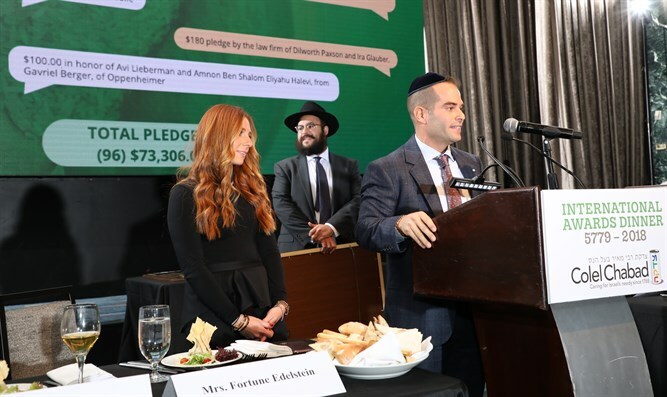 As a proud benefactor of the Friends of the Israel Defense Forces (FIDF), Rabbi Eckstein also partners with a litany of worthy charities that help Holocaust survivors and others who are face difficult challenges on the trajectory of life. This year's Kesser Shem Tov award went to Joel Jacob. The founder and chairman of The Bottle Crew, the global supplier of glass and plastic bottles, caps and sprayers, Jacob has linked his unwavering dedication to combating hunger with his company's success. "G-d gave us two hands, one to take care of our customers and our family, and the other to give back to the community," he said. Also speaking at the Colel Chabad dinner were Rabbi Jonathan Perlman, of the New Light Congregation, one of the congregations inside the Tree of Life Synagogue in the Squirrel Hill section of Pittsburgh. Several of Rabbi Perlman’s congregants were murdered during the now infamous massacre that claimed 11 Jewish lives on Shabbat morning on October 27. Richard Born, the chairman of the Colel Chabad dinner told the assemblage that for the last three decades a pillar of the Colel Chabad dinner has been the esteemed Rubashkin family. "For the last ten years we had prayed fervently for the release of Rabbi Shalom Mordechai Rubashkin and now he is with us tonight through this great miracle." Before Rabbi Rubashkin led the ebullient gathering in Psalms, he expressed his heartfelt thanks and appreciation to everyone who had prayed for him and for his release from prison. In a special video presentation, Rabbi Sholom Duchman, the director of Colel Chabad, spoke of the abject poverty that engulfed Israel decades ago and noted that while Israel has seen a tremendous economic growth, there are still 100,000 families in Israel who suffer from food insecurity. It is only through the Rebbe's blessings and Hashem's chesed that we have been able to accomplish this and there is still much, much more to be done," he said. During the 2018 shareholders report, he gathering was told of a number of food initiatives sponsored by Colel Chabad. Among the 75 programs that Colel Chabad operates throughout Israel to aid the poor and needy are the following: Colel Chabad's Keren Hayedidut Partnership which helps elderly Holocaust survivors; Colel Chabad's United Soup Kitchens program which serves fresh, hot nutritious meals 365 days a year in 21 free restaurants for the elderly and handicapped, who cannot care for themselves and need cooked meals; Colel Chabad's Blavatnik Initiative for Food Security serves 10,800 families each month across 48 cities in Israel by providing a food card for purchasing food in local supermarkets, monthly deliveries of fresh fruit, vegetables, dry goods such as rice, beans, lentils and peas as well as offering education on home management and fiscal responsibility; The Knaster Brown Bag Lunch Program and Meals which are available at all of Colel Chabad's daycare centers. 1,050 toddlers and children are fed each day while their working mothers enjoy peace of mind; The Orphan Intervention Program known as Chesed Menachem Mendel which provides orphaned boys and girls with psychological counseling, social integration, help with homework, tutoring, music lessons, Big Brother and Big Sister programs, retreats, vacation, summer camps and holiday gifts. Colel Chabad operates residential and rehab centers for people with severe neurological disorders. Both the Beit Finger Campus in Jerusalem and the Grabski Rehabilitation Center in Migdal Haemek are setting the global standard for the advance care for people with neurological disorders - the only institutions of its kind. For the 21st consecutive year, Colel Chabad has hosted 420 weddings for the poor at the Gutnick and Hadar wedding halls. Their Keren Moshe Fund enabled orphaned brides and grooms to start their new lives in dignity. The total expenditures for 2018 was $46,447,367. In a video presentation, Colel Chabad celebrated their 15-year partnership with Rabbi Eckstein in helping to feed Israel's hungry - especially the elderly, the infirm and Holocaust survivors. Rabbi Duchman then presented a plaque of appreciation to Rabbi Eckstein for his unwavering support of Colel Chabad. Honoree David Edelstein said in a video presentation that he remembers hearing the name Colel Chabad since he was a very small child. "My grandfather, Michael Edelstein, was a Holocaust survivor from the Western Ukraine and at age 11 he escaped the Nazis. He had a very difficult childhood and no one should ever have to endure what he did." In the video, David's grandfather could be heard saying, "And she gave me a piece of bread and she said run my child, maybe you will survive. And those were the last words that my mother spoke to me." David said that his grandfather's experience makes him appreciate everything that he has. "Because of my grandfather's experience, he feels a commitment to helping others he has sponsored many soup kitchens that feed people daily," he said. "The most important thing to live for is your kids. It is up to us as parents to inculcate them with the values of giving to others who are in need. And we need young people to start the fire, to plant the seed and to get involved in the great work that Colel Chabad does, " David added. David and his wife Fortune were then presented with a plaque of appreciation for their efforts in supporting Colel Chabad. Investors Bank seeks to improve the lives of people far beyond the neighborhoods they touch. As such, the guest of honor at the Colel Chabad dinner was Kevin Cummings, the chairman of Investors Bank. He is among the "Righteous of the Nations" - a true and loyal friend of Israel, the Jewish community and Colel Chabad. In a private interview, Cummings said, "We at Investors Bank became involved in the extraordinary work that Colel Chabad does because we heard the voices of our customers; we heard what was important to them and we know that as a financial institution it is incumbent upon us to help others, however, whenever and wherever we can." "Food and encouragement go a long way in nurturing the bodies and souls of those in need," he added. Cummings was then presented with a plaque of appreciation for his inspiration leadership in supporting Colel Chabad.